Fall in Carlisle is coming – no leaves are turning yet but you can feel it in the air. The weather this weekend is fantastic and that crisp mid-60’s feeling that New England gets around Halloween. One of the things I missed while living deep in the city in San Francisco is the smell of Fall. Hay being brought in, leaves turning, the wild grapes ripening on the vines. Two weeks ago, when I was mowing the lawn on the swamp side of my parent’s house, I could definitely smell the wild grapes ripening. The same while I was installing the mailbox – there are small wild Concord Grape vines in both locations. The smell is one of harvest and is something I am really looking forward to as things go on at my new place. I promised, in return for taking out a line of ratty white pines on the property line between myself and the Kimball’s, that I would place obvious property markers along the property line. We agreed that I would put in grape arbors – and also plant some trees on their side of the property line – type to be determined, but hopefully apple? My plan is to use the big boulders remaining from blasting to periodically dot the property line and then mount vineyard equipment and plant native Concord Grapes (see the link to Ephraim Bull’s story on how he developed the Concord grape. His original vines are still growing a few miles down the road). The University of Maine has some great videos on Youtube about how to grow and manage grapes – but there is a really fantastic person who does work on Youtube – Dr Tom Zabadal from Michican State University. He produces very interesting and watchable videos. 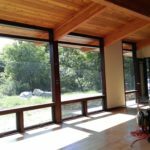 The intent is that I will produce a very defined property line and have some visual blocking of the old dairy barn and structures – but not block the sun coming in from the south. And wonderful harvest smells of course! My parent’s and I took a ride over to the house yesterday and just hung out in the living room enjoying the quiet – it is a very, very quiet space. Sitting on the window seat was wonderful. 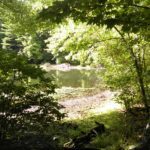 Then we took a walk from Kimball’s parking lot down around the other side of the old mill pond from my property and over and around Bates Pond to see how much of the house you can see from the dirt road into the pond and the trail. Right now the answer is ‘not much’ – but that will change a little as the leaves fall. But still, it is very private. 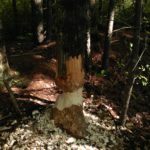 Walking around Bates Pond on the Carlisle Trail’s Committee trail, we were surprised to see signs of active beavers – there are a few trees felled by beaver around that are pretty old – but this is brand, brand new sign. Pictures below. 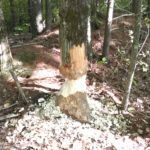 Bates pond September 2016 – active beavers!